Far more serious was Steven Kane's accident at Tarzan. Arriving at full speed, he went straight off into gravel and came to an abrupt and painful halt in the tyre barriers. He then had to be extracted from the car and was taken to hospital, bruised and battered. The car was damaged beyond repair, but it was academic anyway, because the doctors refused to pass him fit to race. And so, everyone moved up a space on the grid. Actually, it might well have been possible to write the report for the 15th Marlboro Masters before it even started. ASM F3 have dominated this race for the last few years, and in practice they showed no sign that this year would be any different. In addition they have crushed the opposition in the 2005 Euro Series to such an extent that by the time most of the runners got here, they already expected to be beaten. Qualifying was a relative walkover, and Lewis Hamilton was in front almost from the moment the lights turned green at the end of the pitlane, signalling the start of the untimed sessions on Saturday morning. Anyone who thought they were in with a chance of leading this race were rapidly disabused of that notion as soon as the lights on the gantry went out, and Hamilton streaked off the grid, the grey car trailed by its sister-car, with Sutil at the wheel. The Manor Motorsport car of Lucas di Grassi was right with the German, the Brazilian keen to try and make an impression on at least one of the ASM runners if he could. At the rear of the grid, Keiko Ihara (Carlin Motorsport) was last before they even made it to Tarzan, while the first retirements came on the very first lap too. They were Ferdinand Kool (JB Motorsports), who fell victim to a broken gearbox before he could go anywhere much, and Ryan Lewis (T-Sport) who went off at the Marlboro Bend, and was most likely a victim of his own over-enthusiastic attacking style! As Hamilton progressed untroubled at the front, the whole thing started to take on a "watching paint dry" fascination, where you knew nothing was going to change, but you kept on watching just in case. Sutil began to lose ground, and was holding di Grassi up, while Paul di Resta in the other Manor Motorsport was fighting Kohei Hirate (Team Rosberg) for fourth place. In the face of the Mercedes engine's superior fire-power there wasn't a lot the Japanese could do, and by lap three the Scot was through and shadowing di Grassi. And so it would remain at the front, despite back markers, sand on the track, and anything else much really. The real battle was a little further back, and it took it a while to take shape. Before it did there were a number of incidents, involving a wide variety of drivers. Dan Clarke (Double R Racing) was the next to bite the dust, spinning out almost before anyone had noticed he was there. Esteban Guerreri (Team Midland Euro Series) also decided he'd had enough on lap 2, and ended his race in a handy gravel trap. The two were not related. We weren't done with drama yet, either. By lap 4, Bruno Senna (Double R Racing) had completed the perfect end to the perfect day for his team boss, Anthony "Boyo" Hieatt, and was out of contention, meaning the team had managed a total of 6 racing laps. James Rossiter (Signature-Plus) ran into the rear end of the Brazilian, almost inevitably in the Marlboro Curve, and they were both out on the spot. As Hamilton pulled inexorably away from Sutil, who was busy trying to hold off di Grassi, the battle for the "best of the rest" was hotting up, with Giedo van der Garde (Team Rosberg) battling with Marko Asmer (Hitech Racing) and Franck Perera (Prema Powerteam) for 6th place. They were joined in short order by Hannes Neuhauser (HBR Motorsport), Alvaro Parente (Carlin Motorsport), Loïc Duval (Signature-Plus). Sebastian Vettel (ASM Mücke Motorsport), Charlie Kimball (Carlin Motorsport), Mike Conway (Fortec Motorsport), Christian Bakkerud and James Walker (Fortec Motorsport). This mob ran round in a high speed train for a large part of the race, despite a rate of attrition early on that caused a lot of wincing in the pits. The trouble was no one could find an overtaking spot, which meant that van der Garde and Asmer eventually broke away, while the rest of them ran in procession, albeit at very high speed. A little further back, Greg Franchi was getting tired of being behind rookie Alvaro Barba (Hitech Racing) and made what can best be described as a very muscular move on the Spaniard at Tarzan. It paid off, but there was little hope of him getting much further unless he could find a way past Nico Verdonck (Team Midland Euro Series). He couldn't; he tried repeatedly but it just wouldn't stick. It was entertaining but ultimately rather pointless, as they ended up scrapping over 20th place. After that, things seemed to settle down rather, though Walker and Bakkerud came uncoupled from the train on lap 10, when Walker tried to go round the outside of the young Dane, only to have Christian fight back. As the two of them went round Tarzan side-by-side, with Walker on the outside, the inevitable happened, when Walker wouldn't give way to a somewhat optimistic move on Bakkerud's part. Walker's car was pushed into the air, landing squarely in the gravel traps. Bakkerud couldn't avoid going in as well, and by the time the dust cleared they were shaking their fists at each other from behind the Armco! That reduced the numbers somewhat, and also brought out both the yellow flags, and the dreaded Zandvoort white trucks to tow the wreckage away. It was interesting that most of the first fourteen drivers didn't appear to reduce their pace at all, despite the flags and a lot of desperate waving from the marshals. They were fortunate no one was hit, and no one collected the breakdown trucks. It's singularly irresponsible behaviour and it seems no one has learned much from Monaco, with the possible exception of Hamilton, who did reduce his pace. The broken cars were taken away with alacrity, and the corner was soon back to normal, just in time for Parente to exit the group as well. It was also round about the time you would have expected the tyres to start going off, a feature which caused a few problems last year. However, there appear to be no cracks in the ASM armour these days, and Hamilton had been trying to look after his tyres from the start. A brief wobbly moment for him at Tarzan was the result of sand being thrown onto the track by the breakdown trucks, rather than any reduction in Kumho adhesion. There was to be no respite there for everyone else. Some of the front runners were now starting to break away from the train too, with van der Garde pretty much out on his own, leaving Asmer to lead the pack. Behind the group Atila Abreu (ASL Mücke Motorsport) was losing his hold on the scrapping bunch too, as he seemed to be having trouble locating his gears when he needed them. They were there - he just had to hunt for them, the graunching noises as he arrived at Tarzan being truly horrible to hear; oddly, it didn't seem to have slowed him down at all, at least until the final lap or so, and the didn't lose any places. Moreau also lost touch a bit when he started running very wide at Tarzan, a sign perhaps that all was not well with his tyres. He was starting to take almost as odd a line as Barba, who kept arriving almost sideways, as if the presence of a corner had surprised him. What Barba was doing was the sort of thing you usually see in a Formula Ford race here, but not a Formula Three race. Still, he's pretty inexperienced and he'd never been to Zandvoort before, so maybe the Hitech boys should just be grateful they got the car back in one piece. Actually, it wasn't a good day for the Spaniards in general, because with ten laps to go, the last retirement came, when Alejandro Nunez (HBR Motorsport) went out of the race. He hadn't been challenging for any significant position, but it was a shame anyway. With five laps left to run, it looked like Barba had plans to join his compatriot on the sidelines, when he was tripped up into one of those classic Tarzan spins. However, he managed to pull himself together and went on his way, last but one, ahead of Ihara who was starting to be lapped by the leaders. He then got in Hamilton's way, causing a certain amount of gesturing, but eventually got the message of the blue flags, letting the ASM car through without causing further disgruntlement. With the closing stages of the race now upon us, Hamilton was being very careful. Sutil was now forced into a very defensive mode, when di Grassi began to look very threatening in his mirrors; maybe an upset was possible. Certainly di Grassi was pleased to be so close, and although he never did find a way round, afterwards he said he felt as if he'd won. And so, inevitably it seemed, ASM won the 15th running of the Marlboro Masters of F3, Hamilton making the sinuous track through the dunes his own this weekend. With Sutil in 2nd, di Grassi 3rd and di Resta 4th, it was a Mercedes-engined lockout. In addition, Hamilton and di Resta lifted the Nations Cup for Britain, and everyone else was left to wonder why they'd bothered to turn up. In 5th was Hirate, despite a couple of desperately sideways moments towards the end. 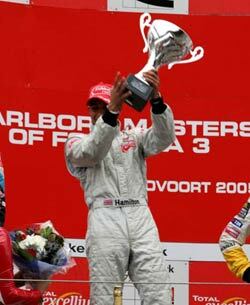 Van der Garde was 6th, with Asmer 7th, the highest placed of the British F3 series runners. Behind him, in very close formation as they had been from the start were Perera, Neuhauser, Duval, Vettel, Kimball, Conway and Moreau. Poor Ihara was lapped by the lot of them pretty much in one go, which must have been rather unnerving for her. Abreu was next, from Ho-Pin Tung (JB Motorsport), Zwolsman, Marco Bonanomi (Prema Powerteam), Stephen Jelley, Verdonck and Franchi (who were also still glued together), Thomas Holzer (AM Holzer Rennsport) and Ronayne O'Mahony (Fortec Motorsport). Barba and Ihara both finished a lap down. Afterwards Hamilton was justifiably delighted. "After the first few laps I had a fantastic gap for the lead, but I knew there was a long, long way to go. If I could just save my car for the first few laps, l knew I could pull out into the lead. I tried to make my tyres last because it's a very long race and I think I did it perfectly. I had a 2.7 gap and I tried to keep it at that and keep consistent. I knew if I could keep it like that it's hard out there, so I knew Adrian and the others would be making mistakes and I just had to make sure I didn't. I don't think the weekend could have been better for me. I had a fantastic race - and a fantastic season so far. I have to say thank you to the team. The reason we are so fast is because of the fantastic mechanics. They do seem to be very, very capable .I didn't make any mistakes in that race, and it was a long race. The tyres were starting to go off towards the end, but I looked after them really well at the start." Sutil, too, was delighted with his result. "I think from both of us it was very good. I started with no pressure and was getting better and better, and finally it was a good race for sure. I'm happy to be second at Marlboro Masters the best race in the world and for Lewis I'm very happy for him he was faster this weekend but it will be me next time. Of course, I'm with the best team, and we have the best people, so it's much easier to show what I'm capable of." Di Grassi was in far more buoyant mood than he had been on Friday after getting so close to Sutil. "Here at the Masters it's all about qualifying and yesterday was a bit disappointing. The Mercedes engines have more downforce and I knew it would be very, very hard to overtake, because we don't have that sort of downforce. At first corner I was just hoping for him to make a mistake, but Adrian drove well. I was a little bit more consistent than him, which allowed me to catch up. I had a good setup of course, but in the end they were just that second quicker than we were. I think I have more of a chance against ASM now. The thing is a few weeks ago in Monaco we were two seconds lap slower. Of course, in the championship it will be very hard to catch them, but we would like to end the season as the only team able to beat ASM. However, you can't be sad to be on the podium, like I said, for me it is like a victory to be behind ASM. We weren't quicker than them, but we are much closer."